Pat O'Mara's personal account of the police strike in Liverpool, August 1919 and the subsequent riot, taken from his autobiography The Autobiography of a Liverpool Slummy. Shortly after the Lusitania riots came the Liverpool Police strike. * Perhaps the bobbies had just cause for bitterness, for theirs were the only wages that hadn’t skyrocketed with the war. I thought they were getting ample pay at the time but, like everyone else – excluding the manufacturer, who was the first to raise the cry of traitor to a striker – they wanted much more. It required a piece of legislation to raise the salaries of the bobbies and, as none was forthcoming, they became very restless and finally, in direct opposition to the advice of their superiors who pointed out the severity with which such an unpatriotic act would be dealt, they struck. Some people believed that the thing was engineered inside local government circles to obviate the paying of pensions to the older men, a great number of whom were about ready for retirement. But this I don’t believe, for it isn’t like British policy. Others had it that the plot was hatched in Berlin to give the local butchers a chance to get evenwith other tradesmen who had profited when the pork butchers were put out of business. But I don’t believe this either. I personally blame the profiteering spirit, then all the go. When the bobbies saw men of the Murray stripe making three times their wages, no wonder they felt an injustice was being done them! Like its inglorious predecessor, the strike resulted in wholesale destruction of property, much looting and the eventual repayment via the public taxes. It was upon as just as suddenly the Lusitania riots and it was precisely to my liking, what with my new-found spirit of self-indulgence and my constant need of cash. The bobbies were on strike! There were no bobbies! That could only mean one thing, and that thing happened. I was coming out of the Daulby Hall with Jackie Sanchez (having mooched the entrance fee from him) at the time when the first fever caught on. We went across the street to Skranvinsky’s chip-and-fish shop and listened to speculations over this new and strange strike. As we stood in the crowd a couple of bucks walked in, ordered in some chips and fish and refused to pay for them, suggesting to the hysterical Mrs Skranvinsky that she “get a bloody bobby!” Then they walked out, followed by others not yed paid up, who had taken the hint. Some leaned across the counter and grabbed handfuls of chips and fish and scallops, and without waiting to salt them, continued brazenly out into the street. Only Mrs Skravinsky’s screams kept those on the outside at bay. There were no bobbies! We were outside. On the corners here and there stood the bobbies, grimly passive and, to signify the fact, with no official labels on their arms. Excited groups of hooligans eyed them wonderingly. A jewelry window just down London Road crashed in, and as bobbies smiled wonder vanished from the hooligans. Another window crashed in. It was the Lusitania all over again, only much more intense, since now there was no restraining hand at all. Hands were out grasping through the jewelry store windows. 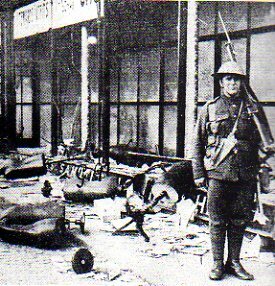 Inside other stores whose windows were bash in, respectable-looking men and women joined with slummies to gather up loot and flee homeward. Every store with anything worth steeling was broken into and the furnishings wrecked in the frenzy to get the best stuff available. I did not have anything like good luck until Ben Hyde’s pawnshop farther down London Road was reached. After the windows were bashed in, the place was ransacked, lockers pulled out, pledged articles tucked into aprons. I got hold of a couple of muffs that struck me, in my innocence, as very expensive things and once outside, fearing the riot would be shortlived, I skipped away from Jackie, tucked two precious furs under my coat, and sped along the comparatively quiet streets for home. Alice was sleeping on the sofa but my mother was up, as usual waiting for me to come in, and as I chucked the muffs down on the kitchen table triumphantly and told her how they had been gotten, she said determinedly: “Take them dirty, bloody stolen things out of here!” I thought her quite mad after what I’d been through to get them. Besides, when again would such an opportunity present itself? I told her that they might be worth a lot of money; after which I brought up the sophistry that since everyone was stealing, it was no more than right I do it too. But after all this she said again quite firmly: “You take them bloody things out of here! I never thought I’d have a robber in the family. You’re your daddy’s son all right!” Then I started feeling the muffs and got to feel them. Poor women, she’d never seen such quality, and they certainly impressed her. “They’re worth something in pawn mammy!” I argued. “Yes,” she said feeling them again “But they’re stolen!” Again she insisted that I take them back, and when I told her the impossibilty of this and the dangers it entailed, she suggested taking them down the street to the dock and chucking them in. I wouldn’t think of this, of course, and as I was quite a man then I had my way – my mother washing her hands of the whole affair, though wishing secretly she could find some way to keep the muffs and at the same time keep her conscience clear. The following day, I took them up to a little fence I knew in Scotland Road and disposed of both of them, since the new police force (installed overnight to the consternation of the neo-pensioner striking bobbies and to the remorse of the others) was doing a bit of detective work in recovering stolen goods and bringing the criminals to book. *Pat O'Mara states that the strike followed shortly after the Lusitania riots. In fact, the war had finished before the police took their action.